The origins of most popular landscape designs for both homes and public spaces originated in Europe, simply because they have a longer history, and many immigrants brought their ideas over with them. Even backyards in Texas have aspects of European influences from centuries ago. European landscape garden design started in Italy, with the renaissance in the 15th century. Prior to that time (medieval times), gardens were a place separate from the home, and enclosed by a wall, dedicated to growing vegetables, herbs and fruit to be used in the kitchen. Renaissance scholars had time to rediscover earlier Roman gardens where they had used them to relax and enjoy, rather than kept them locked away. So the early Italian gardens were designed for enjoyment with shade trees, covered trellis tunnels and larger areas for games and pastimes. Gradually gardens became status symbols with architects commissioned to build larger and more elaborate designs. The status value of a large garden was further subsequently developed by the French and became more formal. 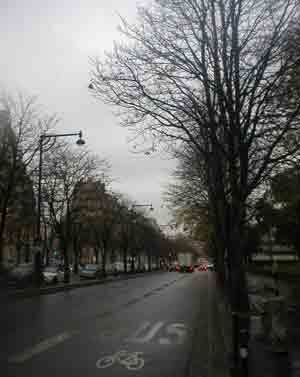 The design formality extended to rows of trees and plants in a symmetric pattern, in some way indicating man’s control over the otherwise chaotic natural environment. The formal garden probably reached its peak with the largest gardens in Europe – the Gardens of Versailles (Grand Palace designed during the late 1600’s by landscape architect André Le Notre) for Louis the Fourteenth. The layout focused on the symbol of the sun, the King’s emblem, and the symmetry was designed on a strict east-west axis for emphasis. At Versailles it is still possible to see the formal gardens with their geometric shapes and symmetry on a grand scale. After the decline of the power of the monarchy in France, the formal shapes began to soften into shapes that were not so precise, with grassy areas that required less maintenance. With the relaxation of formal rigor, other influences were found, this time from England, with its focus on natural settings and rural architecture. The English style was created around an idyllic view of nature, with a lake, rolling lawns of grass with groupings of trees strategically positioned for effect. Often rustic items such as bridges and ruins were added to the scene to create the picture-perfect landscape. In fact some of the larger scale gardens were shaped to resemble a particular scene from a painting or artistic style. One of the main influencers at that time was Capability Brown (1716–1783), who reduced the use of geometric structures with extensive use of lawns punctuated by isolated groups of trees for effect. Many public parks were subsequently laid out using the same principles, much of which has survived and been adapted to the present time. Today we have a number of different styles applying gardening principles from all around the world, with Asia also being a contributor as well. One of the best places to appreciate the many varying styles of landscaping is at a center of botanic excellence such as the Dallas Arboretum, where many different styles of garden are constructed and laid out by specialists in landscaping design to be enjoyed, without needing to travel the world’s great gardens. Without doubt the world’s greatest designer was and remains Leonardo Da Vinci. There is nobody of his stature who has been able to combine the left brain with the right brain and take it to such heights. He was born in 1452 and was a rare genius who was supremely talented in multiple areas. His ability as a painter, sculptor, architect, engineer, mathematician, inventor, geologist, biologist and writer was astonishing, and remains so to this day. Leonardo was one of the leading lights of the Italian Renaissance, well known for his creative abilities. He was a hugely influential artist and sculptor, which what most people remember him but he was immensely talented as a scientist, engineer and inventor. Although he did not receive any traditional scientific training, his talent for observation and detail with a deep level of understanding took him to a higher plane of scientific knowledge. Leonardo’s real genius was the fact that he was able to straddle both art and science, or as I would like to say a genius designer. What overshadows Da Vinci’s work as a designer is his surviving artwork. Only around fifteen of his paintings have survived to this day due to his experimentation with different techniques and switching from one topic to another rapidly. However paintings such as The Last Supper, Virgin of The Rocks, The Mona Lisa, not to mention drawings such as Vitruvian Man meant Leonardo was destined to go down in history as a great artist. He studied anatomy to enable his drawings of the body to be more accurate, and we still marvel at them today. From a design perspective we marvel at his inventions. He was employed as an engineer in Venice and devised a series of movable barriers to protect the city from being attacked, in addition to working with Maciavelli on a large scale scheme to divert the Arno river. In the early 1500’s Leonardo designed a unique single span bridge which was approximately 720 feet long to span the mouth of the Bosporus river. It was not constructed because the sponsor did not have enough faith in the design, but single span bridges have since proven viable. Leonardo was very interested in related scientific subjects of gravity, optics, anatomy and particularly flight. In 1505 he wrote his Codex on the Flight of birds, which was a notebook of 36 pages containing great detail on how birds fly with notes and sketches. He covered principles of aerodynamics such as the way air behaves as a fluid when it moves over a bird’s wing surface which are fundamental to flight even today. Over time he produced over 500 sketches of flying machines, the nature of air and bird flight. He even discussed what type on man-made machines would be capable of flight, similar to birds. 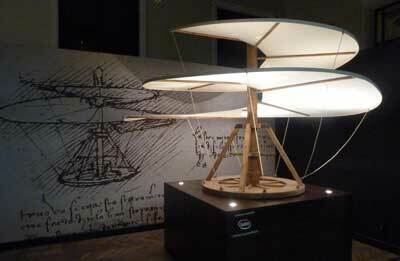 More than that he designed them as well, he produced drawings of a flapping ornithopter , a machine with a helical rotor (helicopter), parachute, bicycle, giant crossbow, bicycle and airplane all more than 500 years ahead of the time they were actually ‘invented’.